This shows how drain responsibility affected by different types of property. Assuming the property has no shared drains, the homeowner will be responsible for the drains up to the property boundary (purple), and the local water authority will be responsible for blockages in the main sewer and lateral drains (red). 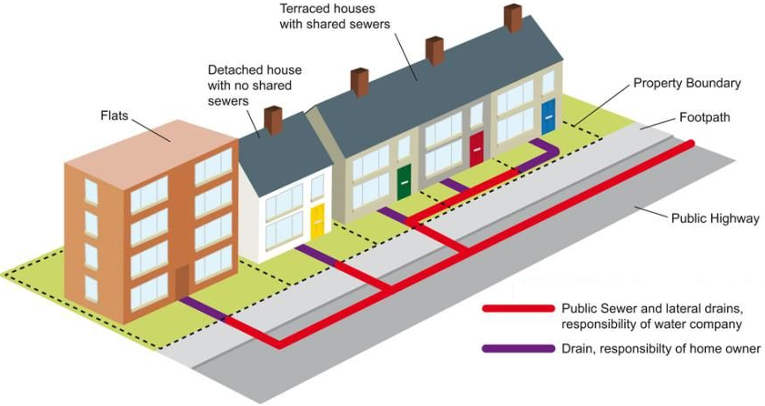 If you have a drain that is shared with your neighbour, the water authority will be responsible for the shared drain as well as the lateral drains (red). You are only responsible for the drain on your property that is not shared (purple). If you live in a block of flats or apartments, the management company are responsible for all drains up to the property boundary (purple) and the local water authority for drains beyond that (red). Call your local water authority (www.thameswater.co.uk or www.southernwater.co.uk) and they will be able to advise whether your blocked drain is a shared drain. If it is shared they will come out. 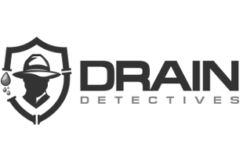 If it isn’t you will need to contact a drain contractor, such as Drain Detectives. Is someone telling you something different? Your friend or neighbour might not be aware of the changes that the government made in October 2011, which meant that the responsibility of shared drains on your property or lateral drains has been transferred to the local water authority from the homeowner. See the government website. A lateral drain is a pipe which carries wastewater away from your home. It is located outside the boundary of your property, often under a public pavement or road and joins up to the public sewer in the road. Prior to the change in the law in 2011, a lateral drain was the responsibility of the homeowner but is now the responsibility of the local water authority. All the above information assumed that your property was linked to a public sewer. If however you live on an unadopted road and have a private sewer, you are responsible for the cost of maintaining and repairing it. If the sewer serves a number of properties, all the owners are jointly responsible for any costs. There is more detailed information about water and sewerage on the OFWAT website www.ofwat.gov.uk. Next Next post: Why have a pre-purchase drain survey?